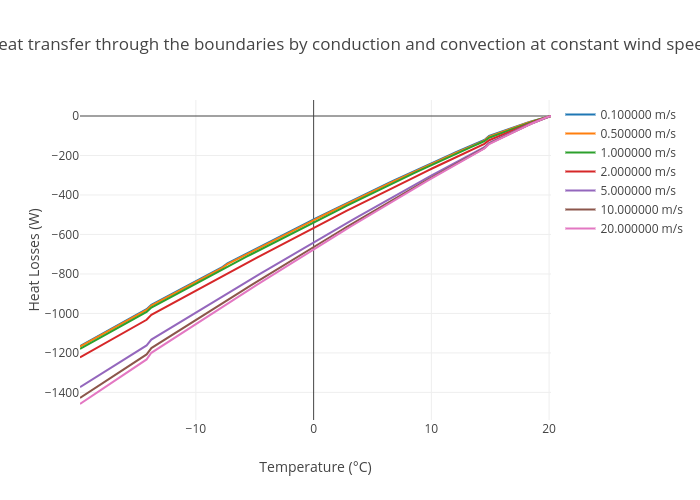 Aurelienp's interactive graph and data of "Heat transfer through the boundaries by conduction and convection at constant wind speed" is a scatter chart, showing 0.100000 m/s, 0.500000 m/s, 1.000000 m/s, 2.000000 m/s, 5.000000 m/s, 10.000000 m/s, 20.000000 m/s; with Temperature (°C) in the x-axis and Heat Losses (W) in the y-axis.. The x-axis shows values from 0 to 0. The y-axis shows values from 0 to 0.